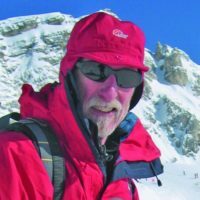 Graham's love of mountain sports started when, at the age of 14, he was dragged up his first VS by the noted Yorkshire climber, Alan Austin. Climbing remained a major passion until it had to take second place behind a busy professional career, which allowed for little more than annual holidays throughout the alpine regions. After retirement he and wife Meg moved to the west coast of Ireland where, living in the midst of the Twelve Bens, he had the opportunity to make up for lost time! However, Graham, and wife Meg, have incurably itchy feet! After Ireland, they spent some years dividing their time between the Lake District and the Dolomites, before settling for a while in Italy. Home for the next few years was a little village at the foot of Mt Agner, one of the giants of the southern Dolomites. Graham had begun his exploration of the Dolomites as far back as 1997. He was immediately drawn to climbing via ferratas, partly by the sheer audacity of the bigger routes, but also by their historic resonance. Exploration of the area round Lake Garda showed that climbing via ferratas could also be a year-round activity, not just confined to the summer climbing season. After the years spent researching the guidebooks with old friends John and Marion, Graham and Meg are now able to make time for other mountain sports, such as mountain biking and skiing. However, perhaps inevitably, their feet have started to itch again, and they recently sold up to head for pastures new. Watch this space!